Mazda 2 launched: sedan and hatchback, RM80K to RM85K! 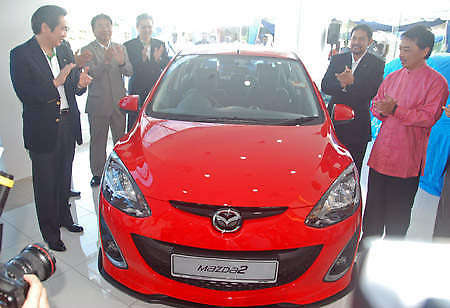 Home » Local News » Mazda 2 launched: sedan and hatchback, RM80K to RM85K! The Mazda 2 was launched hours ago at Prima Merdu’s third and latest showroom in Bandar Puteri Puchong. Available in two bodystyles – five-door hatchback and four-door sedan – the supermini is imported CBU from Thailand. It rolls off the Auto Alliance plant in Rayong, which will also supply us with the upcoming Ford Fiesta. The B-segment Mazda is powered by a 1.5-litre MZR engine producing 103 bhp at 6,000 rpm and 135 Nm of torque at 4,000 rpm, figures that are slightly shy of the similar sized engines from the Vios and City. The DOHC 16v unit with Sequential Valve Timing (SV-T) is paired to a four-speed automatic; I was personally hoping for a manual version, which is available both in Thailand and Singapore, but no such luck for us. You can choose between the standard V Grade and the sporty R Grade for both bodystyles. While both grades come with the same MacPherson strut front and torsion beam rear suspension, the R Grade suspension gets “Sport Tuning”. Front brakes are ventilated discs while rears are drums. The 2’s steering system is of the EPS variety. Opt for the R Grade and your Mazda 2 will roll on low profile 195/45 R16 rubber while the V Grade does with 185/55 R15 tyres. Dimensions wise, Mazda’s little hatchback appears very petite. Width is identical with the Toyota Yaris and Honda Jazz down to the mm (1,695) and the 3,922 mm length is only 2 mm longer than the Jazz. 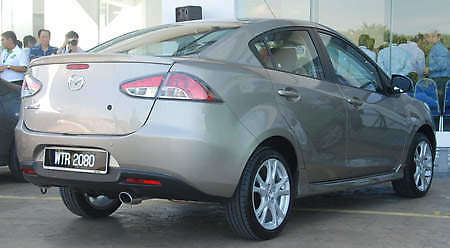 However, the reason behind its svelte looks is the low roofline – the 2’s height of 1,478 mm is 47 mm less than the Jazz’s. While the hatch looks cute and pert, the same can’t be said of the sedan; that protruding boot just spoils the proportions. Its overall length of 4,263 mm is a substantial 132 mm shorter than the Honda City’s. Wheelbase is 2,490 mm for both variants. What we can say for sure, for now, is that if you have tall family members or friends, this car is definitely not for you. My not too tall 175 cm frame managed to fit in with only two fingers widths of headroom to space to spare. Previous Post: 2010 Petronas Malaysian Grand Prix – High-Res gallery!